What is the purpose of the 1100mm High Gas Cylinder Trolley? The 1100mm High Gas Cylinder Trolley is outstanding for transferring tanks from one location to another. The maximum weight capacity for the gas trolley is 100kg. The frame is constructed from fully welded tubular steel. The blade is made from a steel sheet and has a 3 sided rim. 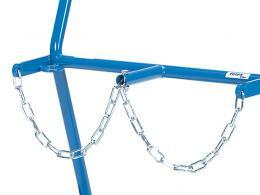 A safety chain holds the cylinders safely in place. The trolley can hold 2 x 20 litre/kg bottles. 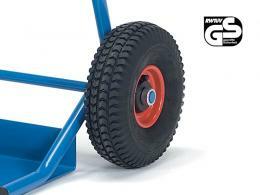 There are two types of tyres available for the trolley, solid rubber or pneumatic. The tyres will glide through any terrain. Dimensions of the trolley are 1100mm x 760mm. 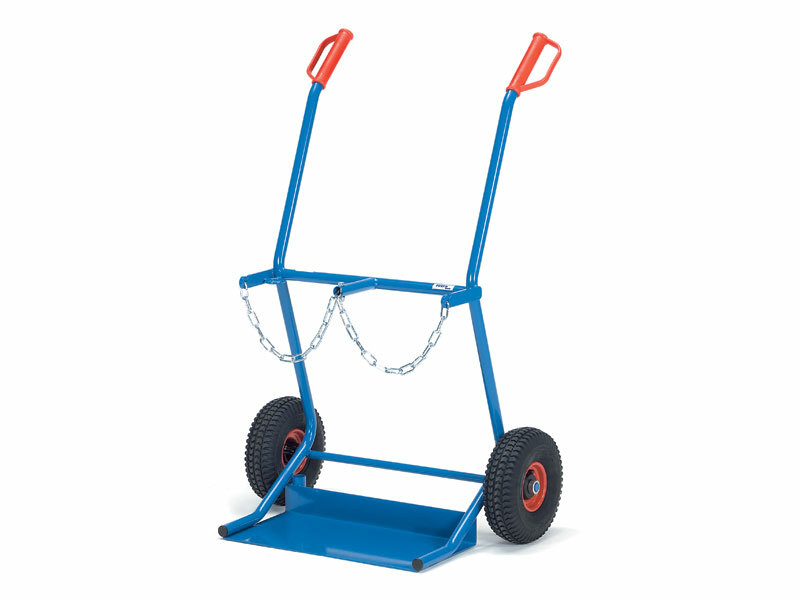 The cylinder trolley is available in blue. Where can this Bottle Trolley be used? 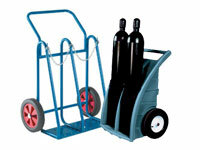 Facilities that use, house, or sell gas cylinders will have a great need for the trolley. The product allows heavy tanks to be moved with ease. This ensures injuries will not occur. Gas cylinders are awkward to carry and the trolley gives a realistic alternative to hauling them by hand. Being able to carry 2 at a time is convenient for multiple larger loads. Who might use this Gas Truck? Companies that sell propane for tanks will use the trolley to place orders for customers. The trolley can also be used for deliveries for easy loading and unloading. Having access to the trolley will make jobs quicker and will ensure the employee is safe from injury. Customers can also use the trolley to load their own gas cylinders into their vehicles. The best materials have gone into the construction of the trolley. The product is highly durable under normal work conditions.